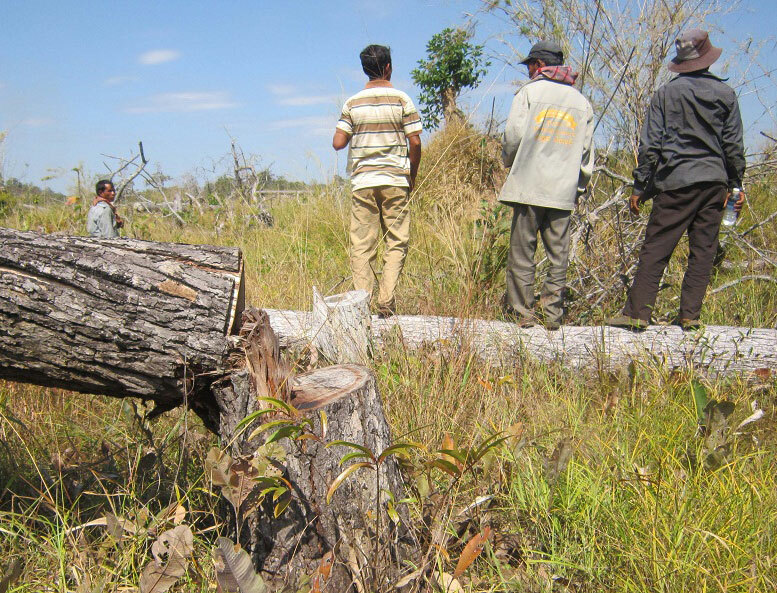 Villagers and ADHOC investigators inspect freshly cut trees near Kunthy mountain in Ratanakiri, Jan. 2014. Members of a community-based organization in Cambodia responsible for protecting local forest resources have confessed to illegally cutting down trees to sell to local businessmen, prompting the group’s leader to threaten to resign. Moeung Yay, Forestry Commission leader for the Ou Chum commune in Cambodia’s eastern Ratanakiri province, said that he will convene a community meeting next week to announce his resignation, citing his failure to prevent the illegal logging. Logging in the forest—which had been entrusted by Cambodia’s Ministry of Agriculture to the commune for its use and protection—has been carried on by “powerful” community members, including several local officials, in spite of written pledges not to illicitly harvest timber, Moeung Yay told RFA’s Khmer Service on Wednesday. “They have logged for a long time now, and the logging is definitely increasing,” Moeung Yay said. “They sell the timber to buyers, with some buyers going down to the forest to buy, and we can’t do anything about them,” he said. Six community members have been summoned so far by commune authorities to answer charges of illegal logging, and five have already confessed, he said. Moeung Yay said that following his resignation he will return the 130-hectare community forest to government forestry authorities to manage. No reports of illegal logging in the area have been filed yet with authorities, though, provincial forestry administration director Vorng Sokserei told RFA, adding that forestry officials will investigate the case. “We have stated in the contract [signed with the commune] that we can reclaim the forest and manage it as state property, and that we can levy fines,” he said. Commune authorities may first require those accused of logging to re-sign their contracts promising not to illegally harvest timber, Ou Chum village chief Khann Savy said. Chhay Thy, provincial coordinator for the Cambodia-based rights group Adhoc, meanwhile urged community members to preserve their role in managing local forests in order to strengthen Cambodia’s forestry law. Village culture in Cambodia traditionally seeks to resolve problems outside the court system, he noted. “But illegal loggers should be taken to court,” he said. Reported by Ratha Visal for RFA’s Khmer Service. Translated by Samean Yun. Written in English by Richard Finney.